Adding more RAM is a qucik and effective way to improve your system performance, as having more RAM often means more responsive multitasking and faster program switching. 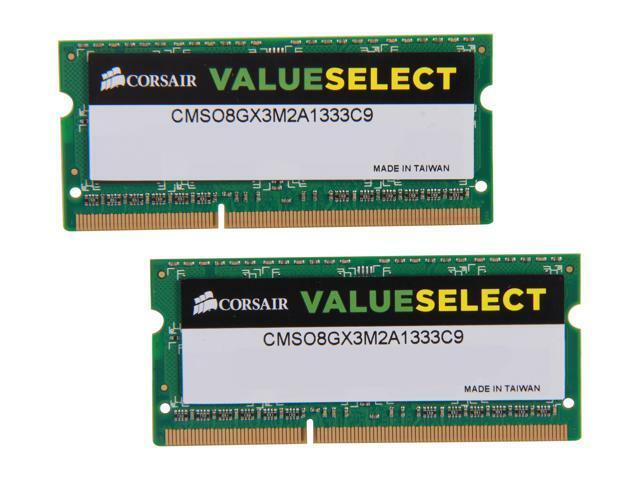 The Corsair ValueSelect laptop memory modules are the best upgrade choice for your office and home computers due to their better performance and lower price. It's tested to Corsair's tough standards and is stable, reliable, and compatible with virtually all major laptop systems. Add this memory module and watch performance skyrocket. This Corsair laptop memory kit is rated at 1,333MHz, and delivers up to 10.6Gbps bandwidth per channel. You'll find it ideal for the evolving needs of today's operating systems and applications. CAS Latency 9 ensures a smooth system response. Superior components, quality construction, and rigorous testing guarantee reliability and stability for use in challenging environments. Corsair ValueSelect laptop memory supports the Intel and AMD sockets for easy installation and solid performance. Pros: I had been experiencing slow down of my laptop for some time. Contacted ANTOnline and they helped me to select the memory I needed. Got it on schedule and installed and my laptop performance has gone up my at least 40%. Cons: NO cons, the price was great, the product arrived on schedule, and it worked great! Other Thoughts: ANTOnline has a great service and I will buy from them again in the future! Pros: Fast. Made a significant improvement in the performance of my laptop. Other Thoughts: 4GBs of mem for laptops even for everyday use is a waste of time. particularly if the videocard shares that memory. Pros: Upgraded an HP Probook 6450b and the memory worked great. Pros: It works. Logs in at 7.7 GB (slight loss is normal). Cons: Price is a smidge high for "value" brand RAM. Other Thoughts: If I could give Newegg a rating, it would be 2 eggs. I ordered another type of RAM first that their tool said was compatible. It was not. I still had to pay return shipping and they would only give me a store credit which is why I got this. I lost money on the deal, but that's life. Make sure you only buy products that have an Iron Egg Guarantee. Cons: Dead on arrival. Causes memtest to hang. Other Thoughts: I didn't think it was likely I would get two sets of RAM that were faulty but it happened. Cons: DOA out of the box. Would not boot, failed memtest. Other Thoughts: This is the 2nd time this has happened to me with Corsair memory in a row. They need to fix some quality control issues.